I’ve had a hard time finding out much about the contents of this record. It’s a little odd. I think I’ve figured it out, though. The label makes it look like this was the on-air broadcast disc. But when I played it, I found that at the beginning there’s one piece of music by a different band, then some dead air, then the second part of a “Music by Warrington” program which just fades out at the end. My guess is that my grandpa saw that there was enough blank space at the beginning of the record to squeeze in another song, so that’s what he did after the broadcast but before taking the disc home. The first piece is “Siboney.” In my grandpa’s notes he said it was by Warrington, but it’s obviously not part of that program. The announcer says it’s “Andre Castellanich and his 45 Caballeros.” I’m not sure of the spelling of the band leader’s name, and a Google search using various spellings found nothing for either him or the band. Maybe someone out there can fill me in on them. Edit: thanks to reader Marcel for letting me know that the bandleader is André Kostelanetz. 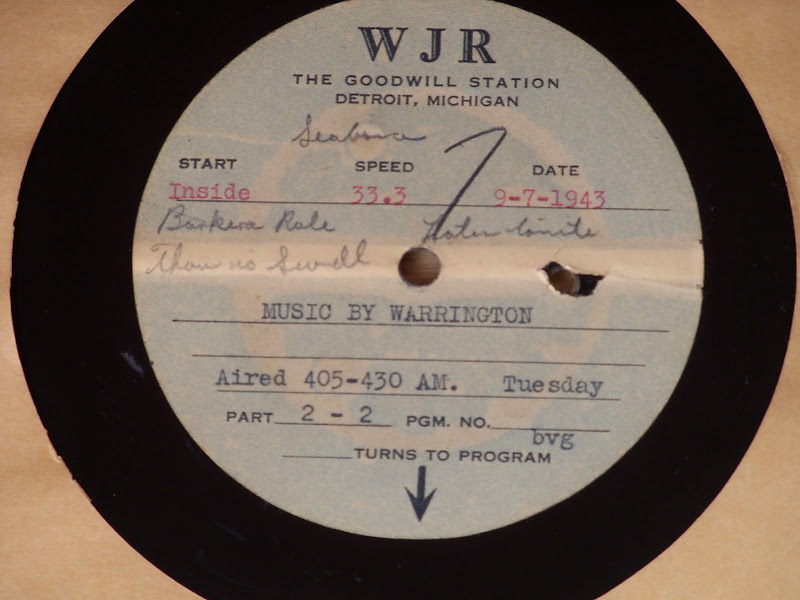 Now, “Music by Warrington.” Johnny Warrington was a band leader, composer and arranger who had a show out of Philadelphia in the 1940s, which is where this broadcast came from. He became a prolific arranger in the ’50s and his arrangements are still popular with big bands. This program (which is part two of two, and I don’t have part one) includes “Barcarolle,” “Later Tonight,” and “Thou Swell.” Of the arrangement of “Barcarolle,” the announcer says, “Offenbach never meant it that way but it swings merrily along just the same.” “Later Tonight” is sung by Jack Hunter. All Google could find about him was that he sang with the Elliot Lawrence Orchestra in Philadelphia. Another challenge of this recording was the noise level. At the beginning of the record it’s not bad, but toward the end it’s very noisy and has a lot of pops. I had to set the noise reduction kind of in the middle so I didn’t take too much away from the parts that weren’t too bad. One last note–love my grandpa’s spelling on the label. Here the direct link to my bandcamp page for this program.